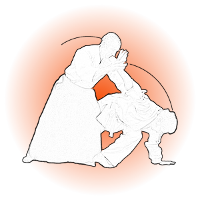 Aikido Beginners: When we first start training aikido it can all seem a bit overwhelming. There's a lot to take on board & our minds are a little overloaded. Hopefully, these hints & tips will help to clarify things by removing some of the noise (excessive thoughts & superfluous movements) that can distract you when training in the dojo. Stretch Athletes stretch to enable their body to perform properly. If you're going to participate in a physical activity like aikido, I'd advise you incorporate stretching into your exercise regime. By taking the time to stretch, not only will you become more supple & less prone to injury but you will also gain a better understanding of your body. You'll have a better understanding of your posture, where you hold tension & how the parts of your body are connected. Taking time to learn your own body outside the dojo where you can study yourself at your own pace, while you're relaxed & still will be a big help when it comes to adding movement or another body into the mix. 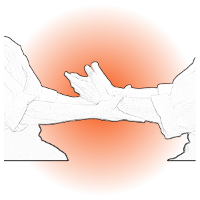 Study hanmi In Iwama Aikido there is a great deal of emphasis on the basics, the foundations on which all of your aikido is based. It doesn't get much more fundamental than hanmi. It's in everything you do. Time spent studying it will be of great benefit. You can grab opportunities to study your hanmi throughout the day: waiting for the kettle to boil; riding in a lift; waiting for a bus or queuing in a shop, for example. Start on your weak side When it's your turn to train always start on your weak side. By always starting on the same side, you'll know which way to stand without thinking. You'll also eliminate any confusion about which side you've done & which side you haven't done when it comes to the second half of your turn. By always starting on your weak side, you'll get a little more practice on that side because you'll have had the chance to train it should sensei clap halfway through your turn. Shoulders remain over hips/feet When standing in hanmi the left shoulder is over the left hip/foot & the right shoulder is over the right hip/foot. This feels natural & gives us stability because our mass is over our base. So, for example, in left hanmi our left side is forward & our right side is back. We wouldn't have the left hip/foot forward & the left shoulder back, twisting at the waist. When performing techniques, try to maintain this stable structure, keeping your hips & shoulders in harmony. Training with the jo helps to highlight this principle. Move to the left with the left, move to the right with the right as a general rule, when we moved to the left side we move with posture the centre moves first & when we move to the right we move with posture the centre moves first. Step & turn on the balls of your feet When stepping try to allow the ball of the foot to make contact first, followed by the heel. By stepping onto the balls of you feet you are more balanced and able to change direction more easily. To see this try standing on your heels...pretty unstable? In contrast, you can stand fairly easily on the balls of your feet. When you turn, you should also turn on the balls of your feet. There is an acupuncture point called yong quan or bubbling spring that is situated between & behind the big toe & 2nd toe. Imagine that this is connecting you to the floor & rotate around that point before placing the heel down. We guide and lead our Uke ( The Attacher). There is no pulling. We generally get our body in a position where we can drive with our hips transmitting this power through our arms to guide and lead the Uke. Extend the arms with an expression of kokyu Maintaining a kokyu arm helps to transfer the power of your hips into your techniques. The kokyu arm isn't locked rigid. It's firm, yet yielding & there's an arc to it - like a bow. The arm spirals forward, combining a rotation (a lot like opening the lid of a large jar - fingers wide apart) with an extension that drives the tegatana & heel of the palm forward. This shape helps us to transmit kokyu ryoku (breath power). It's like the arms & hands are inflated with high pressure air. 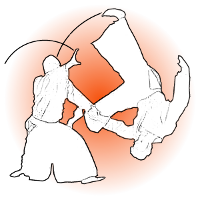 We use this arm shape when we take a forward rolling ukemi. It leads the roll onto the back of the shoulder. As you train & become more aware of this shape you will spot it in many techniques. For example, when performing kokyu dosa, ikkyo, iriminage, shihonage or cutting with a bokken. It is one of those things that's difficult to grasp at first & the shape can elude you. If you find it difficult, following these steps may help you find the shape. Let the arms hang down by your sides. Bring your hands in front of you & interlace your fingers so you can see your palms facing upwards. The tips of the thumb are lightly touching. Keep your elbows away from your sides a little. Raise the hands so the palms are facing your chest, retaining the bow shape in your arms. Turn the palms away from you. Turning at the wrist & maintaining the bow shape. Release the fingers, opening them wide. Allow the hands to rotate so the thumbs point towards each other & the tegatana (hand blade) points forward. You should end up with your arms looking as if they're holding a large imaginary beach ball. You can feel the benefit of this shape by performing a simple experiment. Hold a press-up position with your arms bent at 90º. It won't be long before your arms start trembling. Then extend the arms into this shape & see how much easier it is to hold the position. Keep your hands in front of you The power of the hips is transmitted most effectively when the arms are aligned in front of torso. By this I mean no wider than it. The power of the hips drive the trunk, which moves the shoulders, which transmit the power through the kokyu arm. Training with the bokken teaches us how to move our hands/arms. They move up & down the centre line. They remain in front of us where they are able to transmit the power of our body mass more effectively. An arm held out to the side is weak. 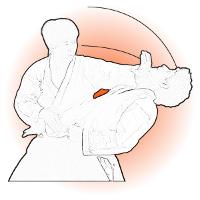 When performing the 5th ken suburi, beginners tend to let the arms circle around their heads - cutting off of the sides of their heads instead of the from the top. However, it isn't the arms that circle it's the bokken. The arms move up & down the centre line. Of course not all techniques are performed so rigidly, but the arms generally stay in front of the torso. A good example is morote dori kokyu ho. It seems as though the arms are being used to make the throw but they aren't, it's the hips. The arms are simply raised & lowered. The hips rotate & the weight shifts from one foot to the other. The arms simply follow the hips. Look for similarities We learn aikido through repetition, so the fewer principle you have to practice the more you get to practice them. If you can see that cutting with a bokken is the same as shihonage, then when practice your suburi you are practicing shihonage & vice-versa. Simplify your training by looking for similarities in movements, body shapes & techniques. Practice your suburi It takes about 10 minutes to go through 2 or 3 repetitions of each suburi. If you don't know them yet, learn them. Your weapons are training partners that are always willing, consistant, honest & tireless. Being able to practice your aikido on your own, outside the dojo is priceless. Aikido is like food You need to actually eat food to enjoy the flavour & get the nourishment. You can read books about cooking or watch cookery shows but unless you eat the food, you won't benefit from it. Likewise, you need to actually train aikido to get the benefits & enjoyment from it. So, get up a little earlier in the mornings & do some suburi or practice you tai sabaki when you get home from work. However you manage to fit it into your day, practice your aikido. A little daily practice over a sustained period of time will make a world of difference. Aikido has two sides of practice. Performing technique, and receiving technique. It is vital that you perform breakfalls, to achieve form in technique and to avoid injury. 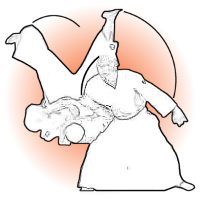 Aikido is non-competitive, so do not enter into contests of strength or aggression. When performing technique you should be relaxed, but not loose. Upright in your posture, but not rigid as this impedes the correct flow of the technique. Have respect for the Sensei / Teacher as they have knowledge and experiences that will help you develop and progress. 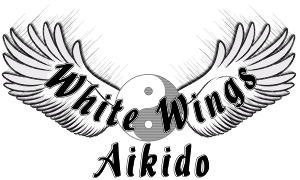 In turn pass on all you know to those who wish to study Aikido. Always be of smart clean appearance. A clean Gi / Uniform, and clean hands, feet and short nails are required at all times. Any jewellery (necklaces, earrings, bangles etc) must be removed before training commences. Wedding bands that cannot be removed must be covered in padded strapping tape to prevent injury. All weapons must be free of fault. Wooden weapons must be free of splinters, cracks and dryness and must be regulary maintained. Katana / Swords must be semi sharp, have a clean blade and the Mekugi / Tang pins checked regulary. Be prompt to training sessions. Always respect the Kamiza / Shrine, and make efforts to set up, take down and cleanes the dojo. Be of a clear mind and bring no bad thoughts or moods into the Tatami / Mat, as this will be detrimental to your Aikido practice. 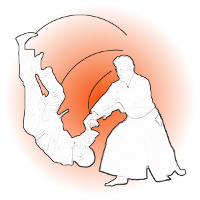 Follow these guidelines for enjoyment in Aikido practice.